Here is the only solution I'm aware of and its fairly rough around the edges. With more research there may be a more elegant solution to be found. All the buttons on the gopro are of the basic mechanical contact type. So if you open up your gopro and are confident in your soldering skills you can do a relatively cheap mod. There are plenty of good tutorials on youtube about opening up your Gopro so you can start with that and see if its something you want to undertake. If you are up the challenge then you will need some very small gauge wire, a couple micro rc switches from Hansen Hobby and as an option(not necessary and requires opening your TX) two position momentary TX switches from Aloft Hobbies. Basically you open up your gopro and solder a wire to the ground on the usb port and wire to each of the positive terminals of the any of the three buttons you want to control. I used some IMU wire from burnt up IMU. Its really small and very flexible. I only do the power and shutter buttons but you can do bluetooth as well. You can trigger any button by taking that wire to ground. Add the micro rc switches inline to your button wires and any spare channel on your RX you can control from your TX. For everyone that missed the original media conference call this morning the FAA/DOt has uploaded a recording to youtube. To hear it straight form the source proposing an amazingly realistic approach is a very welcomed development!!! 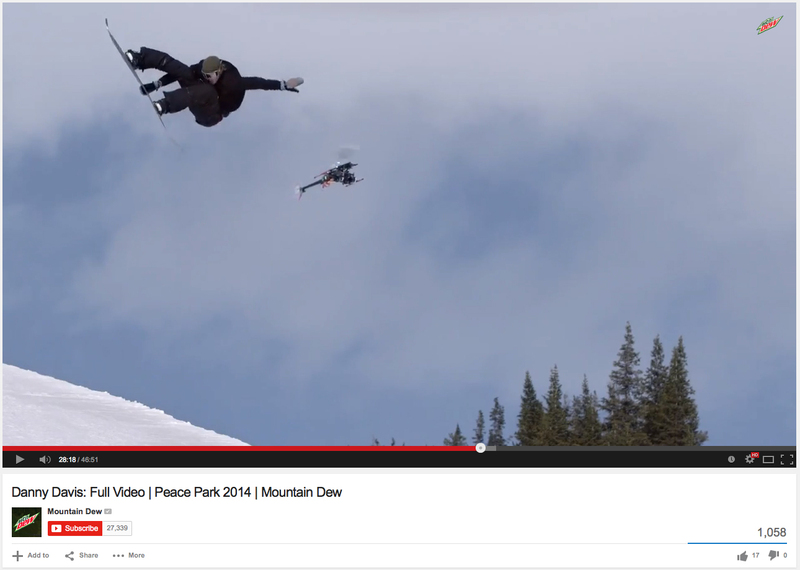 Peace Park aired in full yesterday on ABC. Blown away by how many aerial shots made the final cut...but then again the CK800 was at the masterful hands of Trent and the CopterKids!!! The copter made more cameo shots. Here is my favorite. Here is the CK800 with Ronin. This was a trial on the way to designing V3 of the airframe and gimbal. 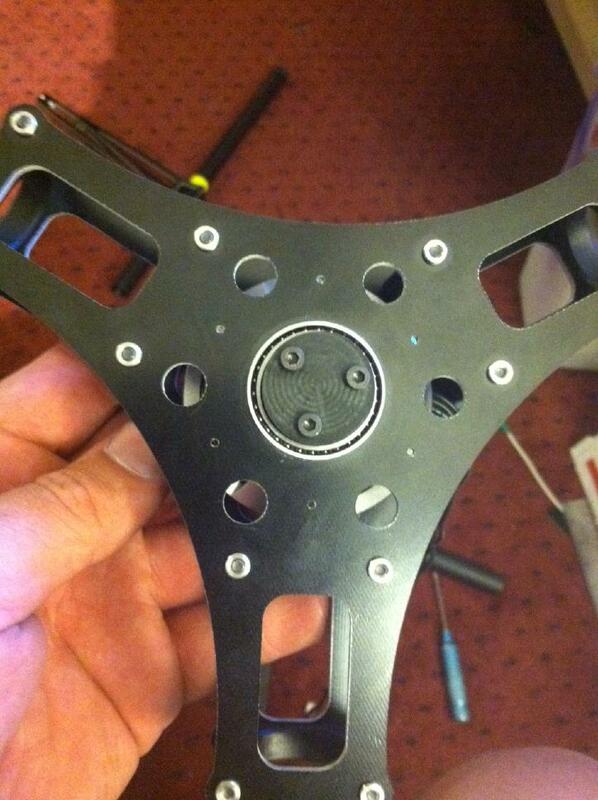 With V3 the gimbal and airframe are integrated so gone are the front tube mounts. Really excited about the new custom wire rope isolators I've designed with the idea to create a system that behaves and reacts more as one single mass rather than two masses with a loose connection point The new gimbal will be brushless of course but with encoders! Exciting times ahead for sure in the workshop!! Recently produced a mount for the Ronin to fly on the CK800. Pretty sure there are not many Ronins flying and being on a single rotor has to be rare. Will post results as they come in from the field. Yesterday the DHL man made my day with the delivery of the new 80mm class gimbal motor from Iflight! There is a lot of interest in these new larger motors to power gimbals capable of flying RED and FS700 cameras so I'll be doing a review here reporting my findings. Initial impressions are good from a construction standpoint. The hub is robust with larger 17mm ID bearings that are well spaced. Securing the motor/can/shaft assembly to the hub is a solid alloy plate with (2) 3mm bolts. This provides a solid connection and hopefully proves up to the task of supporting the loads associated with larger cameras. Pieces for a totally new gimbal are starting to come of the cnc machine and the motors will have a new home for testing this weekend. I'll report back with photos of the complete gimbal and flight reports after the weekend. However, to start things off here are some pictures of the motors dissembled. a lot of wire in those winds! Working on another fun brushless gimbal project in the cnc lab. Here is a fairly standard direct drive unit for pan axis of a brushless gimbal. Custom built these for heavy cameras on tilt axis. T-Motor U8...what a beautiful motor...and here I am ripping it apart! I'll admit I definitely had second thoughts about attempting a rewind once i got this in my hands. The quality of craftsmanship shows and is everything I would expect from a motor in this top price range. The rewind was not as easy as I had hoped with such a large motor. I envisioned having a lot of room to wide each stator. WRONG! The stators are close together and there are 36 of them! Just got word straight from the source that the brushless gimbal test rig works...works well enough in fact to go on location for a Toyota commercial ! Finally have had time to dedicate to the gimbal project to complement the Goblin 800 AP. First run shows a lot of promise with a heavy FS700! More tuning required and flight testing. First test of using brushless gimbal controller on tilt axis with Canon 7D and a long heavy weight lens. The first run results are very promising considering the motors are not tuned to max power, the pole count has not been changed to account for belt drive ratio, balance is still way off. This controller was last tuned for a Gopro3 gimbal!!!! Consider the weight difference between a gopro and 7d with a long lens!!!!!! Given the intensity of forum chatter these days surrounding brushless gimbals, our gimbal development will stay under wraps for the time being. However, major changes have been implemented on the CK800 since the last update. The airframe has been optimized to carry the molded carbon boom(Goblin) and house full retract landing gear. The retract system quickly releases for easy transport. With the new frame design the CK800 is capable of swinging 830 mains with room to spare. I haven't put it on the scales yet but it is arguably the lightest 800 class AP ship out there with no sacrifice in strength and flight performance....this heli could do 3D without the camera! All electronics are neatly contained within the frames and all batteries are easily accessible for fast turn around on the ground. All mass has been concentrated as close to the CG point as possible along all 3 axis(swing weight reduction) to insure the best flight characteristics. 3K carbon all around makes it a sharp looking and high performance bird. Here it is with it's fully retractable landing gear, PS1 gimbal, RED Scarlet and one very stoked owner of CopterKidsLLC. Another fun project for my friends over at CopterKidsllc. These guys push the limits of AP when it comes to high speed & high agility flying while getting the shots. Here is the first proto of the CK2 airframe now based on a goblin770. This configuration allows the absolute closest you can locate the cg of the gimbal to the CG of the airframe...even closer than an underslung! 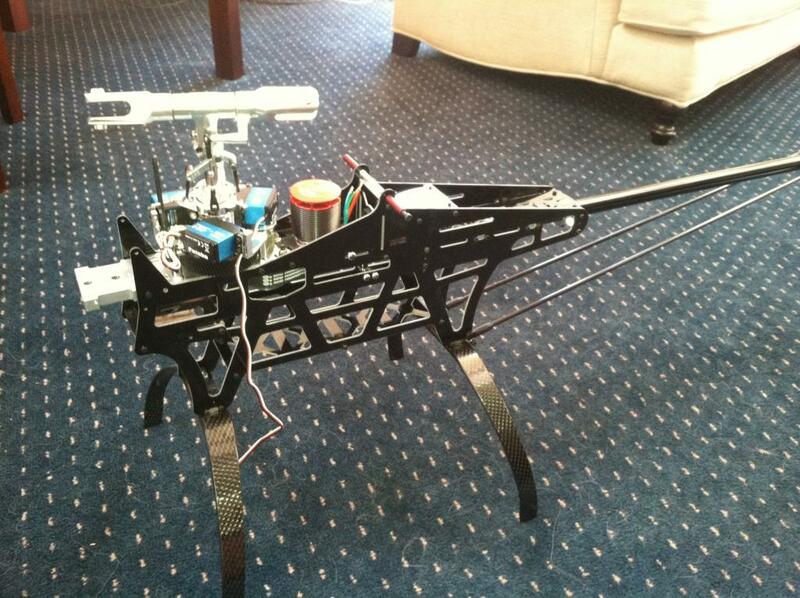 Up next is to design and fit retractable landing gear and a brushless direct drive gimbal. Whats the wrst that can happn?